We have been given access to an invaluable document that offers a fascinating insight of 100 years of Forest Gate history - and many of the people who lived here - from a worm's eye view. It is the school log of Godwin School (boys department only, initially), from its inception in 1883 until the latter days of the last century. This is, effectively, a diary kept by the head - until 1995 a statutory obligation on the post holder. We are deeply indebted to local resident, Karen Higgins, for transcribing the school log - a task undertaken as part of her history degree - giving us such free access to its content and allowing an edited version of her work to be published on this website. Our debt to the various heads of the school who meticulously maintained the log is enormous and our gratitude is extended to them. The school was established as an early initiative by the recently established West Ham School Board (see here for details of early formal education in Forest Gate and the establishment of the School Board). 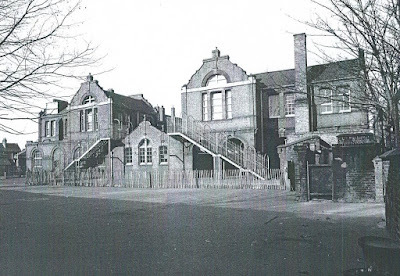 The school was opened in 1883 in temporary accommodation in nearby Essex Street, while the building in Godwin/Cranmer Road was being constructed. For most of its life it was run as two separate schools - a boys and a girls - as was the case with many schools during the early years of state education. Evidence of this can still be found in the more modern entrance sign outside the school in Godwin Road (see photo). We believe the content is intriguing and detailed enough to spread (with a little editorial comment - italicised in brackets - photographs and newspaper extracts) over a number of chapters. We will alternate the posting of these with other posts of Forest Gate interest, over the next few months. the almost mono-cultural nature of the school's roll. Some of the language in this post may seem offensive to the modern reader. We have not flinched from using it, as we believe it provides an accurate view of how, for example disabled, Jewish and Black people were viewed at the time; any attempt to "refine" the language used in the school log would diminish the impact of descriptions of prejudice faced by such minority groups of people at the time. 1 Oct 1883 - The school was opened without ceremony this morning at the Century Hall, Essex Street. The staff consisted: Henry Herbert - headmaster (certified teacher, second class) (ed: the 1881 census showed Henry Hubert to be aged 23 and living at 38 Godwin Road - now demolished - so when the school opened he would only have been in his mid twenties. This is similar to Desmond and Francis' sister - see here, who was also a West Ham Board school head in her twenties. Perhaps the School Board was a far-sighted employer - or possibly just desperate. The area certainly seems to have offered good opportunities to young teachers. ), Albert King (certified assistant), Charles Aspinall (ex pupil teacher) and James Morrell (monitor). (It is interesting to note that this new school opening did not merit a line of copy in only the local paper, the Stratford Express, as far as we have been able to see). 2 Oct 1883 Homework has been commenced in all classes and the parents appear very willing to co-operate with the master in this matter. 24 Mar 1884 To encourage regular attendance and good work, the master offered a prize to each class for the boy obtaining the highest number of marks before Easter. 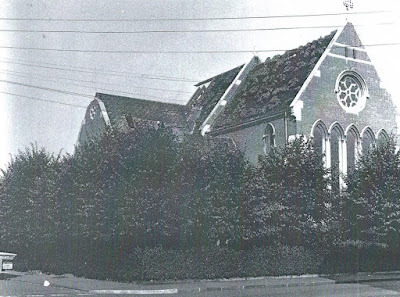 1 Apr 1884 The attendance today has been greatly affected by the consecration of Saint Saviour's church. Many of the boys were kept at home. St Saviour's church, Macdonald Road (1975). 21 Apr 1884 The school reassembled this afternoon. 143 boys were present. 30 June 1884 The attendance today has not been good. Several boys are ill and others are away in the country with their parents (ed: for fruit picking or hop trailing in Kent? - a popular "holiday" for many East Enders in the second half of the nineteenth century). for many East London families. 15 Oct 1884 The master asked the boys in the upper standards to assist him in forming a library. The idea was taken up with great earnestness. 5 Nov 1884 The master gave each of the teachers a syllabus for the next five weeks. The usual fifth of November excitement has lowered the numbers considerably today. 13 Dec 1884 HMI report: The accommodation here is very poor. The progress made in this department (ed: boys), in the face of many difficulties, may, I consider, be fairly characterised as excellent. 13 Apr 1885 Godwin Road school. These schools were opened this morning at nine o'clock by the chairman of the School Board, W Coleman. ... 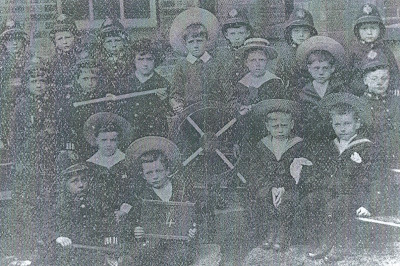 The boys who formed the school in Essex Street were then drafted into the classrooms and commenced their work under the direction of the assistant teacher. (It is interesting to note that this new school opening did not merit a line of copy in only the local paper, the Stratford Express, as far as we have been able to see). 17 Apr 1885 316 boys are now on the roll. (ed: the size has more than doubled in a year, thanks to its move to the new location). 30 Apr 1885 The master examined the homework throughout the school. It will be seen once a week by the master, and all satisfactory books stamped. The boys are assembled on the lines in the playground and the state of boots, hands and faces looked into daily. This is producing good results. 3 Jul 1885 The master examined the homework throughout the school ... Many of the parents object to it being done. 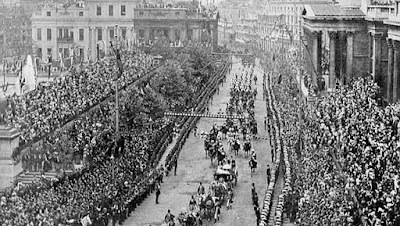 10 Sept 1895 The attendance was good this morning, but owning to the visit of the Lord Mayor and Corporation to West Ham Park, it was greatly affected in the afternoon. Homework was excused. an era of simple public "entertainment"
23 Sept 1885 The master received a note from Mrs Wise, complaining that Mr Wood had struck her son. The master called the teacher's attention to this breach of regulation. 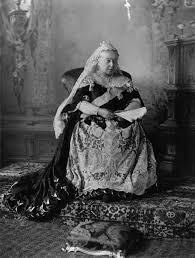 11 Nov 1885 This afternoon 80 boys were absent. The majority had permission from their parents to attend a circus. 29 Jan 1886 Mr Aspinall was absent from school this morning. He attended a party on the previous night and was unfit for his duties. 25 Jun 1886 The master took about 250 boys to the Industrial Exhibition at West Ham at the close of afternoon school. 11 Nov 1886 Mr Atkins called and complained that Mr Wood had pulled his boy's ear some fortnight ago. He further complained that he had boxed his ears today. The master cautioned the teacher to be more careful in his actions with the children. 23 Dec 1886 The school closed this afternoon for the Christmas vacation. The master gave each boy an orange on leaving. 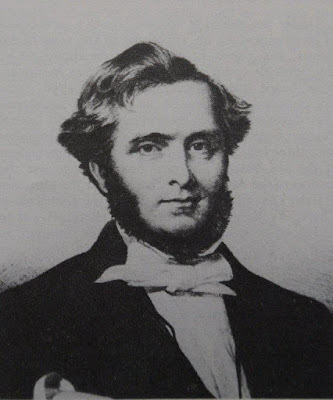 31 Mar 1887 (ed: following further complaints of physical violence towards pupils) Mr Woods left today. 7 Sept 1887 Mr Boyle visited the school this morning. The scholars were photographed. 5 Dec 1887 At the close of the school this afternoon the master allowed the 1st and 2nd classes to remain behind to hear a description of the astronomical part of their geography. This was illustrated with a fine set of diagrams exhibited by means of the Magic Lantern. The boys were very attentive and a clearer idea of the different phenomena was imparted by this means than it is possible to convey by ordinary diagrams. 9 Feb 1888 Mr Shearman from the South Essex Band of Hope gave a short address to the older boys on alcohol and the human body. The master received a letter from Mr Larter asking the master to visit his little son, who is ill. The child having expressed a wish to see him. 27 Jul 1888 The school was closed yesterday for an excursion to the Alexandra Palace (ed: "The People's Palace", opened originally in 1873, then again, after a fire in 1875, as a public recreation, education and entertainment centre in north London. This trip took taken place nine years before the opening of the Forest Gate - Tottenham Railway). The school closed today for the summer holidays. 13 Oct 1889 Percy Randall has been absent eleven weeks with Chicken Pox and sickness and may require exceptional treatment. ... As an incentive for the boys to work neat and accurate papers, the best are stuck up in a prominent place in the school. 14 Jan 1890 HMI report: all three departments of this large school are in excellent condition. 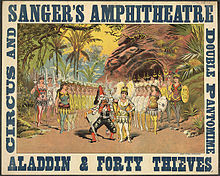 21 Mar 1890 The attendance today has been greatly reduced by a circus in the neighbourhood. George Smith, Standard 7, has left to go on the Great Western Railway. 29 Sept 1890 Fred Cotton was admitted this morning. He has come from Germany and is not familiar with English. He is placed in 1st Standard. Alfred Cundell returned to school this morning. He is a very backward boy and the difficulty he finds with his work in Standard 4 causes him to play truant. 27 Nov 1890 The government examination begins today. The boys were examined by sample. 459 were present out of 469. 23 Apr 1891 The first class commenced this week to read from the 'School Newspaper', with a view to make the reading lessons more interesting and prepare for unseen tests. 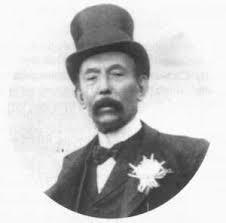 25 Jun 1891 Mr Ashbridge, silversmith of Commercial Rd and Mile End writes asking the master to send him a lad. He writes: "My apology must be that the two lads you have recommended are doing so well we are desirous of obtaining another lad from your school." 1 Sept 1891 School re-opens this morning. (ed, following 1891 Education Act, free education for all scholars takes place from today. Two years later the leaving age was raised to 11, and then 13). 11 Nov 1891 Bernard Biddle was found smoking on coming up the stairs. When spoken to, he was both insolent and insubordinate and the master has punished him. The lad has been several times to the truant school (ed: Fryant Truant school for boys opened in 1885 at Fyfield, near Chipping Ongar, in Essex. 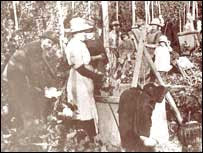 There was accommodation for upto 80 boys who spent time drilling and working in fields gardens and piggeries . In 1907 it closed, and opened as an Industrial School)and it is only by isolation that his influence can be kept from contaminating the other lads similarly returned and other boys inclined to truancy. 26 Jan 1892 HMI report: The tone and order are excellent. High and intelligent aim and systematic work characterise the school. 18 Mar 1892 (ed: this is one entry to illustrate several similar incidents, happening at approx 6 months intervals) Mr Barnes called this afternoon, to let the master know that his little boy had died in the morning from a fit which seized him on Wednesday. (ed: four days later)..The master sent a wreath for the funeral of Cyril Barnes, as a mark of sympathy from the teachers and scholars at the school. 7 Jul 1892 With a view to keep the old boys together and bring some influence to bear upon them, an old boys football club has been formed, called 'Old Godwin'. 11 Nov 1892 A great many boys absent today. Sanger's Circus was the attraction. (ed: this was probably on the Flats. See advert - dated 1896 for Sanger's circus and "amphitheatre, and of "Lord" George Sanger a flamboyant showman of the late Victorian era, who was murdered by one of his disgruntled employees!). 17 Jan 1894 HMI report: The school fully maintains its high character for intelligence and accurate work. The tone and discipline are excellent. 12 Sept 1894 The numbers still high 506 were present this morning. (ed: having trebled in a decade). 10 Dec 1894 Sixteen boys have been sent to Upton Lane school this week to relieve the crowded state of the school. 24 Oct 1895 Mr Earle was allowed to leave at eleven , for the afternoon ... to play (ed: football) for London against Suffolk. 18 Dec 1895 Punished George Carpenter for writing disgusting language on his slate. 14 Feb 1896 S Barnard crept upstairs shortly after 2 o'clock and stole an overcoat. (ed: three days later) ... The parent of the boy who lost his coat prosecuted the boy Barnard. He was remanded to Holloway for a week. 3 Nov 1896 New school at Whitehall Place opened (ed: this later to become Forest Gate Community school). Several boys living in this neighbourhood have gone to this school. 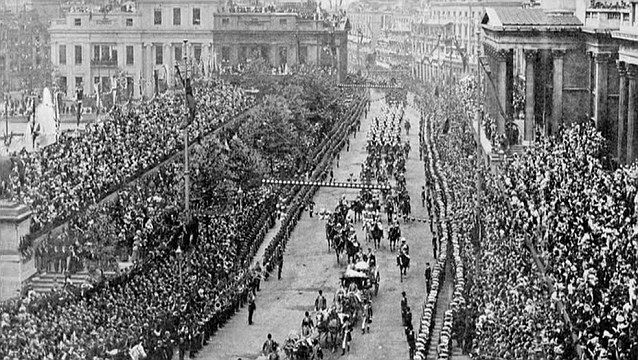 9 Nov 1896 A great number of boys are away to see the Lord Mayor's show. 26 Jan 1897 HMI report: The energy, thought and devotion given to the work, especially by the headmaster, deserves the greatest praise. 14 Feb 1897 Preliminary meeting of Old Boys was held here for the purpose of arranging social gathering of 'Old Boys'. It was a very pleasant matter to see how readily the idea was taken up. A strong committee was formed consisting of staff and 14 'Old Boys'. 18 Jun 1897 Boys assembled in girls' playground, sang some songs and concluded with the National Anthem, all 3 departments singing together. The school was closed for one week in commemoration of the Queen's Diamond Jubilee. 17 Oct 1898 Two of our old boys had unfortunately lost their lives on board the Niohegan, an Atlantic liner, which ran on the rocks off the Lizard on Friday night. 7 Jan 1899 HMI report. The school has done a good year's work ... the doing of some homework by the older boys is a good feature. 3 May 1899 This evening the choir that took part in the Stratford Music Festival (ed: This was founded by John Curwen - see here about his role, in Earlham Grove - in 1882). gaining second prize was entertained at tea. In the evening the parents of the boys were invited to a concert given by the choir. The whole passed off very pleasantly and both boys and parents were delighted. 27 Jul 1899 An excursion with the All Saints Sunday School has greatly affected attendance today. The next episode of the Godwin story - 1900 - 1914 will be posted in a couple of weeks time. I have such lovely memories of Godwin Road school, infants and Juniors. I started there in 1959 aged 5 and left in 1966. Teachers I remember are Mrs Salmon from the infants and Mr Newman and Miss Cooper from the juniors. Headmaster in the juniors was Mr Muir. Very happy days. Lovely school.